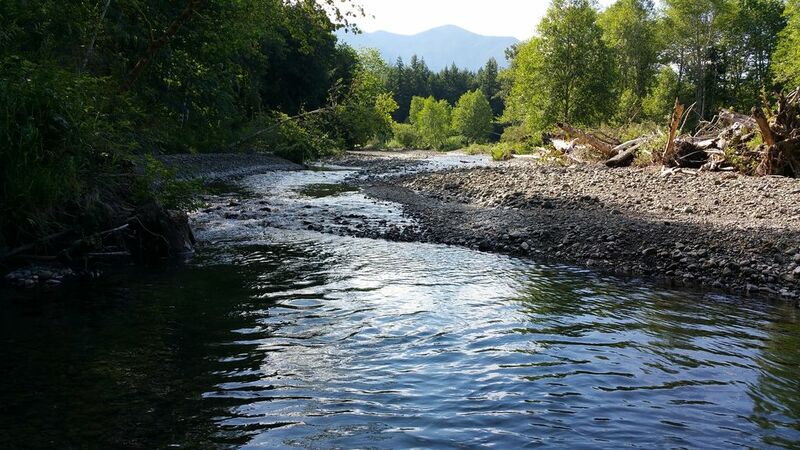 Located at the Base of the Olympic National Forrest, this rental sits on 7 beautiful acres and on top of the bank of the crystal-clear Big Quilcene River, only a short walk away (less than a .25 miles) from the house. This is the perfect place to come after a long days hike in the Olympic Nation Forrest. You can enjoy the sounds of the water rushing and the birds singing as you soak your weary feet in the refreshing glacier run0ff. For those who love salmon. The late summer brings hoards of fish up the Big Quil. You can feel free to try your hand at fishing or just watch as the fish run and the fishermen come out of the woodworks. Don't forget your fishing license if that is your plan. You couldn't ask for a better location, we are 1 mile south of Quilcene, where you will get the small town feel. Old timers dining at the local café, chatting about the way things used to be, politics and upright gossiping. People are friendly to a fault and will go out of their way to point out local attractions when you visit our quaint little town. We are also 25 miles from the eclectic town of Port Townsend and less than 10 miles away from more than a dozen hiking trails in the Olympic National Forrest. The house has a rustic and comfortable feel. With knotty pine walls, a propane fireplace, games of yesteryear, an upright piano, a couple of guitars and vaulted ceilings you feel like you could be in a little mini lodge. There is a fire pit in the back yard that is overlooked by the majestic Mount Walker. Come and embrace the invigorating sensation staying at this true, Cabin in the woods. . This home sleeps four in the provided beds. The home also includes free High Speed WI-FI Internet Access, a TV with DVD player, Propane Stove, and a barbecue grill. Enjoy cooking out on the deck with the BBQ while sitting and enjoying the amazing view of Mount Walker or gathered around the fire pit up close in the back yard. You can also enjoy a camp fire down by the river with complete solitude and seclusion from anything but nature. This property may be shared with campers staying down in the lower area of the property. One last thing, the house does sit close to Highway 101, so you can expect to hear road traffic from time to time. Thank you so much for considering Hikers Retreat for vacation get away. To have a dream means you are truly living. I am a single mom of two amazing young adults. We moved here January of 2007 and have been in love with this property ever since. Stories by the fire pit, fishing the Big Quilcene river during the big salmon run in September, family gatherings are more than words can say about the memories that have been made here. Both my children have gone off to college and living fun productive lives and now I will be preserving something for them to always come home to and to keep me busy with renting out our place and meeting new people. I'm looking forward to the new chapter of life. It couldn't be more perfect to raise kids on. Close to town and school and many adventures for them to keep busy with. Camping, fishing, fires, hiking and all right outside our door. 1 small bathroom with stand up shower. Experience the small town feel when you visit. Welcoming people all around. Gorgeous view of Mt Walker. This property in situation on seven acres that boarder the Big Quilcene River. Kitchen will have all that you may need to prepare a nice home cooked meal. Dining area is small but large enough to sit 8 adults comfortably. There is a piano, so feel free to play while your meal be being prepared. Home was private and beautifully decorated with really comfortable beds! It's right off 101 but still manages to feel remote. Highly recommend. Great house. Everything is set up for a seamless stay. Lots of board games, lots of DVDs, lots of great books in a variety of subjects including local hiking and recreation. The walk down to the river is great. The dogs loved swimming. We didn't want to leave. Easy 5 stars. Next time we are up this way we will rent this place again if possible. Superb surroundings and facilities. We want to come back. Ours was a short two-night stay. We are enthusiastic about the house and its contents. We greatly enjoyed the walk down to the river, which was refreshingly cool on a hot day. Our plan is to make a return visit later from our home in Olympia and, if possible, bring other members of our family. The fridge and kitchen cabinets had multiple items for a longer stay, although we did not use many since we were not sure we were entitled to partake of them. The owner, Shawn, clearly has exceptional taste and instinctively knows what is both attractive and useful for her guests. Our only suggestion for improvement stems from the fact that we did not have a GPS, with the result that Shawn's directions did not prevent us from driving an extra two or three miles north of Quilcene on route 101. We had a good laugh about this when we finally called Shawn, who found us and kindly drove us directly to the house. A good way to pin down the location would be to say that northbound visitors should turn right at the sign to the Solid Waste Transfer unit on the other side of 101. From the house there is absolutely no indication that a waste facility is anywhere nearby. However, if for understandable reasons she does not want to draw attention to it, she could say that guests without a GPS have gone too far if they see the US Ranger Station on the left about a block farther down the road closer to Quilcene. Just a suggestion! Wonderful place very close to lots of multi season hikes. the house was very well stocked, a bottle of complementary wine, and everything was sooo comfortable. we slept very well. things to keep in mind, the property isn’t fenced off and the neighbors have a dog. We kept our pups busy in the river or hiking. If you’re coming in after dark, the easiest way to find the driveway is the large sign next to the driveway for the disposal station across the road. During the day it’s pretty easy to spot. The property was beautiful, comfortable, thoughtfully and generously provisioned. The view of the full moon rising over Mt Walker from the bedroom, was an extra. We had a girls weekend and this place was perfect for it. The house is comfortable and extremely well stocked. Its just a short walk to the river, and it was fun to take a dip in. Close proximity to dining and other fun activities. The dishwasher was broken, but I'd rather have a broken dishwasher than a broken oven, so that worked out. Plenty of kitchen stuff to cook our meals.